DP. 31. 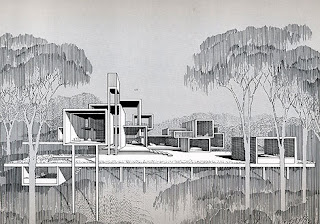 Paul Rudolph Drawings. 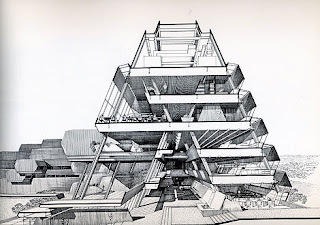 Love love love love love Paul Rudolph and his amazing drawing style. Paul Rudolph was an architect living from the late 1910's to the late 1990's. His work has a very modernistic feel to it and the way he rendered his work on paper was very forward and new back then. He pushed the boundaries of how people rendered their work. I know this isn't a graphic designer, but he is a designer, and I love linear work. Lines are some of my favorite things(that and geometric shapes). Paul Rudolph's work is some of the most gorgeous linear work that I have seen since one Monsieur Frank Llyod Wright. Bask in his amazing artwork on the pages that the sources take you. You must delve deeper into this man's work. It makes me very happy. sources: grain edit, the paul rudolph foundation.